The hacking group Anonymous is alleged to have disrupted access to the Home Office website, apparently in protest at government policies. The website became inaccessible at about 21:00 BST on Saturday; a message blamed "high volume of traffic". The website was accessible again by 02:00 on Sunday. One message on Twitter said it was a protest against "draconian surveillance proposals" but another claimed it was over extradition from the UK to the US. 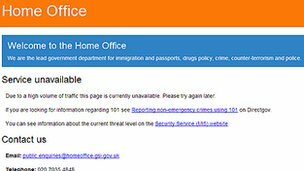 After the website was disrupted on Saturday evening a Home Office spokesman said: "We are aware of some reports that the Home Office website may be the subject of an online protest. "We have put all potential measures in place and will be monitoring the situation very closely." "If a successful denial of service attempt does occur tonight, we will liaise with the technical team and update as necessary," he added. Anonymous began by aiming distributed denial-of-service (DDoS) attacks on websites, like the credit card firm Visa, who had withdrawn services from Wikileaks.